Twenty-nine-year-old workaholic Libby Dewitt lives by the motto ‘if you fail to plan, you plan to fail.’ She’s finally about to start her dream life with her steady-as-a-rock fiancé, Richard Tomy. Together, they’re the perfect power couple—right down to the fact that he’s agreed to use their honeymoon to help further her career in mergers and acquisitions. But ten minutes before the wedding, her dreams dissolve via text message. I laughed throughout this story, it was very cleverly written. I loved the characters and I'm looking forward to reading the next book in the series. I'm pretty sure this is a first Melanie Summers story that I've read and I'm glad I did. A great way to while away a few hours. Libby, Harrison and the rest of the gang are a hoot! I want a resort owning Harrison, please! 5.0 out of 5 starsI love her novels! I didn’t think the author could top the royals series but I was wrong. Another amazing book. Can’t wait for the next instalment. 5.0 out of 5 starsAnother Winner From Melanie Summers! 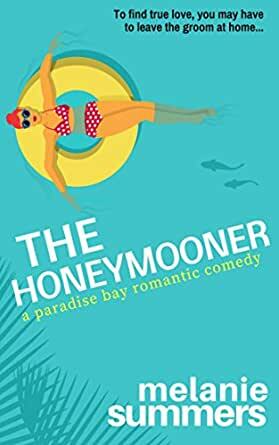 Since I discovered her work last year, Melanie Summers has become one of my favorite RomCom authors and I awaited the release of The Honeymooner with unabashed excitement. I am happy to say that the book lived up to all of my expectations. Reading this story was the next best thing to going on a vacation because the author's vivid descriptions transported me to a tropical paradise where I got to experience island life and fall in love, with both the place and the hunky hero, right along with the protagonist, Libby. Libby has two goals when she arrives at Paradise Bay: 1) Prove to the fiancé who just left her at the altar that she can be spontaneous and adventurous and win him back in the process. 2) Get resort owner, Harrison, to sign off on a takeover by the big hotel group she works for. Naturally, both things prove to be very difficult. Libby hates stepping outside of her comfort zone and trying new things and Harrison tells her in no uncertain terms that he has no intention of selling his family-owned property no matter how much the business is struggling. Sparks fly between Libby and Harrison from their very first meeting, and you would think that it's a case of opposites attracting--Libby being a regimented, Type A control freak while Harrison is a fun-loving, risk-taking guy who likes to enjoy everything life has to offer. But as they get to know each other better, they find they have a lot more in common than either of them thought. One of the things I really liked about this story was that both characters had really interesting backstories and family histories that informed their personalities and how they approached life. Could these two people who are both carrying a lot of emotional baggage be exactly what the other needs? This book was chock full of laugh-out-loud comical moments, swoony romance, and scenes that gave me all the feels. And the author did a wonderful job of setting the stage for future Paradise Bay books starring Harrison's siblings, which I can't wait to read! If you haven't read a Melanie Summers books yet, what are you waiting for? They are a guaranteed good time. 5.0 out of 5 starsIt's a long time since I laughed so much! A highly entertaining romantic novel, this book had me smiling and laughing throughout the reading of it. I was appalled at myself as I laughed hardest at the most tragic moments of Libby's life. This is the first book that I have read by this author and Ms Summers really does know how to put together a story that draws the reader in from the first moments right through to the closing chapter. I could identify with Libby on so many levels. Despite having been humiliated in the worst possible way, she nevertheless keeps her head and formulates a new plan. Harrison is the complete opposite in every way. Where Libby plans every second of her life, Harrison rolls with the punches. Together they discover a chemistry neither of them anticipated and it forces both of them to open their eyes to new possibilities. I thoroughly enjoyed this novel as it is not only well written but incredibly funny and entertaining as well. Although this book apparently is part of a series, it is nevertheless a standalone and comes to a delightful ending. LOVE, LOVE, LOVED IT!!! It was REALLY good. I'm very much hoping there are more in the series because I cared about the whole cast of characters. This book made me sink down into a comfy chair and just grin the whole time. The leading man is exactly how a wonderful leading men should be. The humor is clever, but not over the top. I can't wait for more! Absolutely entertaining and all around great book! After becoming a fan of Melanie Summers books because of the Crown Jewels series, I became a member of her VIP readers club, who means I get to read and review her new releases. So when I received a copy of The Honeymooner, I was very excited. Not only is it a spinoff of Crown Jewels, but it is another rom-com, so I was pretty much guaranteed a wonderful time. And let me tell you it did not disappoint. Even though the story begins in Avonia, most of it is set in the Caribbean islands of Benavente. First we meet Libby Dewitt. A very organized, rational business analyst who knows exactly how her life is going to unfold. Starting with her marrying her boyfriend of 6 years, Richard. That is until he doesn’t show up and dumps her via text. While still in denial Libby decides to go on her honeymoon, that was supposed to double as a work trip to the Benavente Islands, to both clear her head and to hopefully close the deal that will get her the promotion she wanted at work. What Libby didn’t count on was Harrison Banks. Harrison is the owner of Paradise Bay Resort, the same place her company sent her to acquire. Harrison not only turns out to be a complete hunk and gorgeous man, but also a wonderful human being and boss who will do everything in his power to keep his resort and make Libby’s work impossible. We follow them both while they struggle to make the other give up on their plan and also while trying to avoid the chemistry and attraction they feel towards each other. True to its nature, this is an amazing rom-com that is sure to plaster a giant smile on your face while reading. Set in a beautiful setting and filled with great characters and plot, this is a must read if you are a rom-com aficionado. I know I definitely can’t wait to read book 2. Thank you so much to Melanie Summers for including me in your VIP readers club and for providing me with the copy of the book to review.